For other uses, see Centennial Park (disambiguation). Centennial Olympic Park is a 21-acre (85,000 m2) public park located in downtown Atlanta, Georgia owned and operated by the Georgia World Congress Center Authority. It was built by the Atlanta Committee for the Olympic Games (ACOG) as part of the infrastructure improvements for the 1996 Summer Olympics. It plays host to millions of visitors a year and several events, including a summer popular music concert series (Wednesday WindDown) and an annual Independence Day concert and fireworks display. Daily from 7 a.m. to 11 p.m. including holidays, unless otherwise specified for a private event. The park property was previously a variety of vacant lots and abandoned or run-down industrial buildings. ACOG's chief executive, Billy Payne, conceived it as both a central gathering location for visitors and spectators during the Olympics and as a lasting legacy for the city. With the park being the showcase to the world during the Olympics, ACOG decided to hold a design competition to lay out and build the park. Architect EDAW, with the construction and design firm H.J. Russell & Company entry, was selected as the winning design for the park by ACOG. Centennial Olympic Park was constructed in two phases. Phase I of construction was completed July 1996, just in time for 1996 Olympic Summer Games at a cost of US$28 million. During the Olympics, the park contained sponsor exhibits, hosted entertainment and medal presentations, and was a hotbed for pin trading. Phase II construction took place shortly after the Olympics were over and was completed during the following year, in 1998, at the cost of US$15 million. The celebrations in the park were marred by the July 27 bombing which killed two people (one from a heart attack) and injured 111 others. Security at the park and at all sporting venues was subsequently raised to include bag searches and metal detectors at all entrances. The bombing site is adjacent to the Park's "Centennial Tree". It was closed shortly after the Olympics for renovations (including installation of grass) until spring 1998. On March 14, 2008, the park sustained minor damage when a tornado tore through downtown Atlanta. Two of the 65 foot (20 m) tall light towers were blown down. It was the first tornado to hit the downtown area since weather record keeping began in the 1880s. On July 16, 2016, the park held events commemorating the 20th anniversary of the 1996 Olympics and Paralympics, including a volunteer reunion, concessions, and a fireworks show. In November, a commemorative plaque honoring the Games was unveiled. The park is surrounded by many major Atlanta Landmarks; the Georgia World Congress Center, College Football Hall of Fame, Philips Arena, the CNN Center, and Mercedes-Benz Stadium are all on the west side of the park and the Georgia Aquarium, National Center for Civil and Human Rights, and the World of Coca-Cola on the north side of the park. It is bounded by Marietta Street to the west, Baker Street to the north and Centennial Olympic Park Drive to the east and south. Andrew Young International Boulevard, named for the former Atlanta mayor and United Nations ambassador, runs through the southern portion of the park. Since 2008, the area around the park has been marketed, and increasingly referred to in the press, as the Luckie Marietta District. The Atlanta Streetcar passes along the east side of the park, with a stop for the park on Centennial Olympic Drive. A key feature of the park is the Fountain of Rings interactive fountain which features computer-controlled lights and jets of water synchronized with music played from speakers in light towers surrounding it. It forms a splash pad that was designed for children to frolic in, as well as for concert-goers and joggers to cool off in on hot summer days. It consists of 251 jets that shoot 12 to 35 feet (3.7 to 10.7 m) in the air, and also creates a beautiful water sculpture that is essentially the front yard of the nearby museum. An important formal architectural landmark that is also a fun and playful space, the computer controlled fountain concept has since been replicated in other urban designs such as Dundas Square in Toronto and in commercial uses such as the Bellagio Fountains at the Bellagio Hotel & Casino in Las Vegas, Nevada. The fountain area is surrounded by flags representing the host countries of each Summer Olympics preceding the 1996 games and eight 65-foot-tall (20 m) light towers reminiscent of classical Greek marker columns. There are several pieces of sculpture scattered through the park including a statue of Pierre de Coubertin, father of the modern Olympic movement. A small amphitheatre is located at the southern end of the park. The park has shows at the fountain all 365 days of the year, four times daily. They play at 12:30 p.m., 3:30 p.m., 6:30 p.m., and 9:30 p.m. In July 2013, SkyView Atlanta, a transportable Ferris wheel, debuted across the street from the park. The 200-foot (61 m) wheel features 42 air-conditioned cars and views of the park and the surrounding area. The park was paid for in part by the donations of thousands of individuals who bought bricks engraved with the short message of their choice and laid as pavers throughout the park. The contribution for each brick was $35. The message was allowed 15 characters on each of two lines. The finished bricks were laid in alternating light (tan) and dark (brick red) groups comprising a large portion of the 800,000 bricks used in the park's construction. Many contributors ordered replica bricks to keep for themselves as souvenirs. The park has become a catalyst for new development in Atlanta's downtown. The new World of Coca-Cola opened on May 24, 2007, next to the Georgia Aquarium just north of the park, and the Imagine It! Children's Museum of Atlanta opened on March 1, 2004, on a corner northeast of the park. Other significant attractions or developments surrounding the park include The Georgia World Congress Center, the Atlanta Convention and Visitors Bureau, the Atlanta Apparel Mart, the Omni Hotel, the Tabernacle (formerly a House of Blues location during the games), SkyView Atlanta, a 200-foot (61 m) Ferris Wheel, the CNN Center, and the College Football Hall of Fame, State Farm Arena, and Mercedes-Benz Stadium. In 2016, the park received the Downtown Economic Impact Award from Central Atlanta Progress Inc. Centennial Olympic Park was cited for attracting more than $2.4 billion in investment since opening in 1996. ^ "Projects: Centennial Olympic Park Phase I & Phase II". H.J. Russell & Company Construction Group. Archived from the original on December 5, 2008. Retrieved January 26, 2013. ^ Eberly, Tim; Shea, Paul (March 15, 2008). "Tornado Kills, 2 Pummels Downtown". Atlanta Journal and Constitution. Retrieved March 15, 2008. ^ Cook, Rhonda; et al. (March 16, 2008). "Atlanta Tornado: The Aftermath, Landmarks Take a Hit". Atlanta Journal and Constitution. Retrieved March 16, 2008. ^ "New historic marker for 1996 Games unveiled in Centennial Olympic Park". Atlanta Journal-Constitution. Retrieved November 26, 2018. ^ "Historical Marker planted for 1996 Centennial Olympic Games". Atlanta Business Chronicle. Retrieved November 26, 2018. ^ Foreman, Lauren (July 15, 2016). "Relive the 1996 Olympics". Atlanta Journal-Constitution. Retrieved October 10, 2017. ^ "Fountain Pen: Official Visitor's Guide to Centennial Olympic Park" (PDF). May 23, 2011. Retrieved February 19, 2012. ^ "Fountain of Rings: Centennial Olympic Park". Centennial Olympic Park. Retrieved November 5, 2012. ^ Byrnes, Mark (May 21, 2013). "Atlanta's Getting a Ferris Wheel". CityLab. Retrieved August 29, 2013. ^ Schramm, Rebekka; Dingrando, Greg (July 16, 2013). "Giant Ferris Wheel 'SkyView Atlanta' Is Now Open". Atlanta: WGCL-TV. Retrieved August 29, 2013. ^ Layman, Tonya (March 25, 2016). "Centennial Olympic Park receives Downtown Economic Impact Award". Atlanta: Atlanta Business Chronicle. Retrieved February 20, 2017. 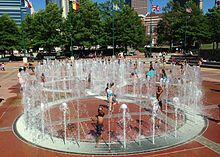 Wikimedia Commons has media related to Centennial Olympic Park.